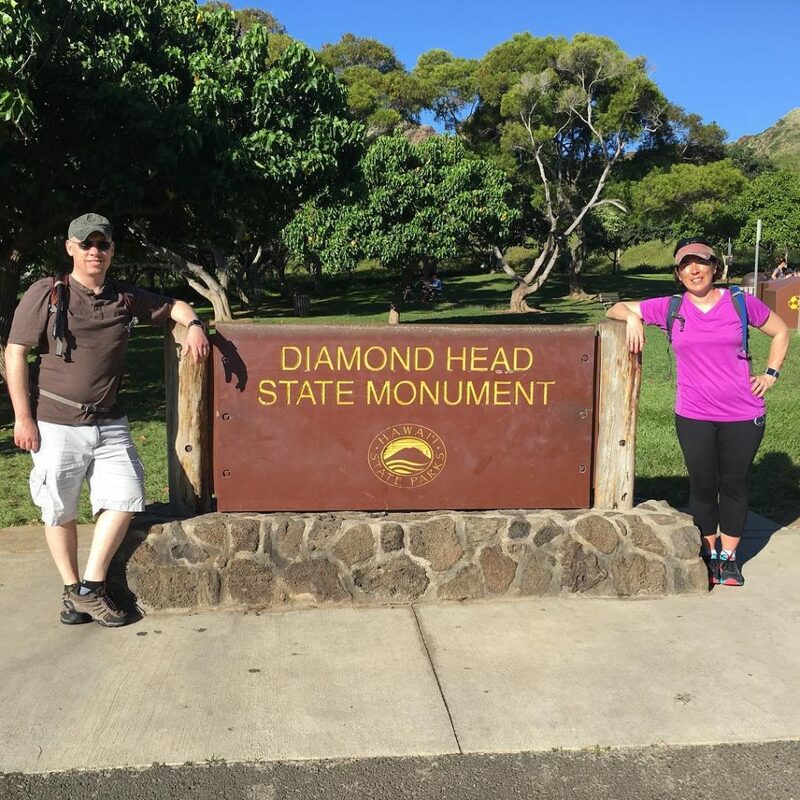 For a Colorado family, hiking up Diamond Head was cake! I just wish it wasn’t so crowded. Today was an active day. We awakened nice and early to take an Uber over to the Diamond Head State Park trailhead, arriving at around 8am. We easily took the trail up and back and enjoyed the views immensely, but didn’t enjoy the crowds or the incredible humidity: we were pretty soaked in sweat by the time we got back to the base area about an hour later. Fantastic Half-Day Family Activity: Go Early Before the Crowds and Heat. 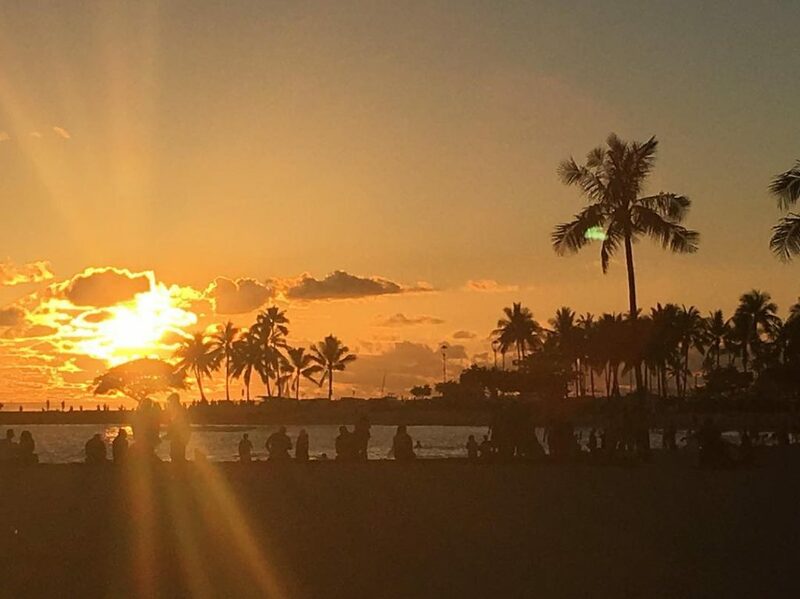 Our family took an Uber from our Waikiki hotel to the Diamond Head State Park parking lot for about $25. We’re glad we didn’t try to drive there — even on a Tuesday morning, the parking lot was full and there’s a fee to park a car that is more than our family’s individual admissions ($1 per person). Recommend visiting as early as possible to beat the crowds and heat. Since we’re from Colorado, this hike was really no big deal. We made it up in about 25 minutes. It might have been faster if there weren’t some crowded spots on the skinnier parts of the trail. However, even at 8:30am, we were soaked in sweat by the time we got to the top. There is a little bit of shade on the trail as you walk under the occasional tree, but there are also long paths of sunniness. You need to be prepared for some claustrophobic areas – there is a dark tunnel, and then there’s a route you can take that involves some skinny stairs, and a spot where you could climb out of a pillbox that’s pretty cramped. There’s an alternate route that takes you around the pillbox, but my sons were interested in the World War II history so we pressed on through. The very top has magnificent views of Waikiki and Honolulu to the west, and Waialae to the east. Unfortunately, it was incredibly crowded at the very top and my teen sons had no interest in spending much time up there. I climbed up on a rock, took a really nice panoramic photo, and immediately headed down to a less-crowded area. For the trip down the trail it was clearly more crowded: tour buses were arriving and we had numerous stops to allow bigger groups heading up the mountain right-of-way. 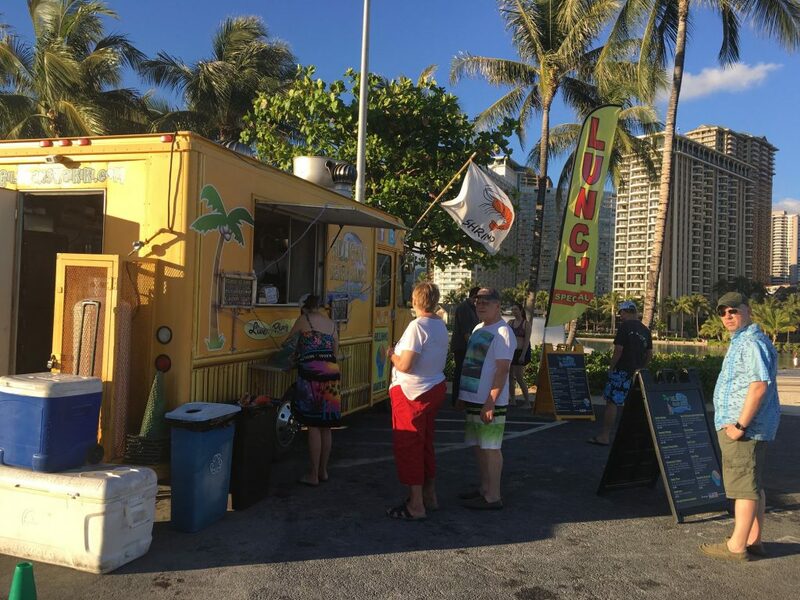 Spend some time at the base of the trail with the Visitor’s Center, gift stand, and be sure to visit the snack truck parked nearby for fresh pineapple and fresh coconut water. 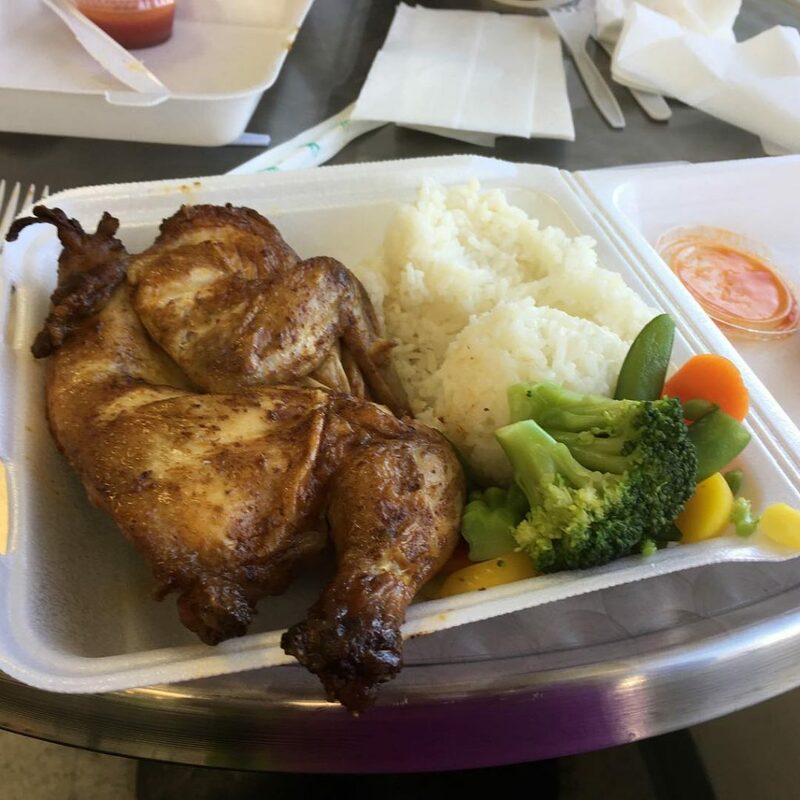 We had wanted to try Mike’s Huli Huli Chicken food truck at some point on this trip, and Google told us it was “only” 1.8 miles away. So we decided to walk there from the crater. Since it was downhill all the way, it couldn’t be that bad, right? It was pretty warm, but lots of fruit trees and flowers kept us occupied on the way. The “half chicken plate” at Mike’s Huli Huli Chicken. It’s not quite the recipe our family knows and loves, but it was still so delicious! These flowers were absolutely gorgeous and so fragrant! 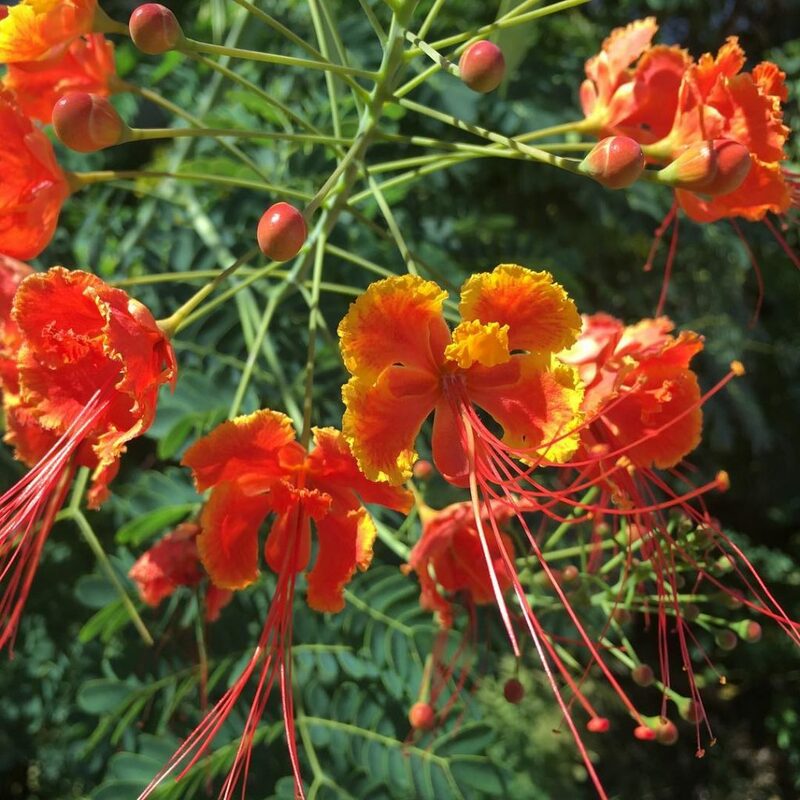 A cool Twitter bot told me it’s a “Caesalpinia pulcherrima”. 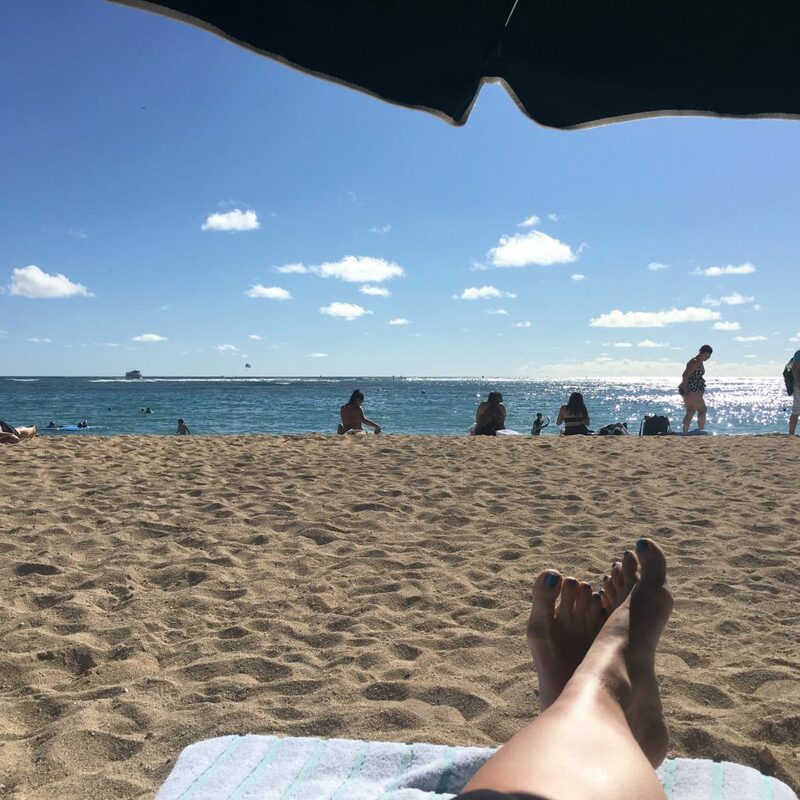 After an early lunch, the Uber surge pricing kicked in, so we decided to just walk the rest of the way back, another 1.7 miles along Waikiki Beach. 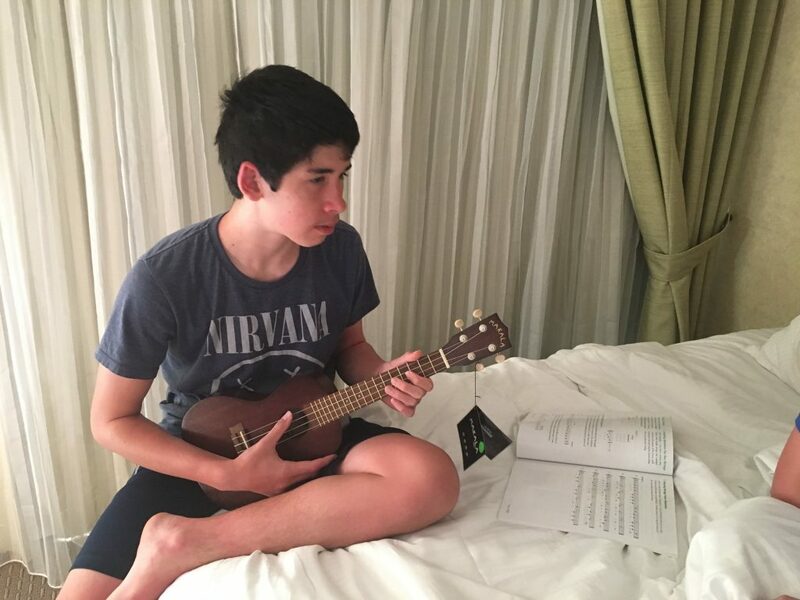 We made a stop at a ukulele shop where Jacob picked out a pretty cool souvenir! We were back at the hotel by 1pm, and spent the rest of the day at the beach and pool…in and out of sleep. I wish I could say I was here the whole afternoon, but in reality I was up and around more checking on the boys…Jacob was in front of me on the beach, Timmy was behind me the pool. I think Dave was asleep. For dinner, Dave and I tried a Gilligan’s Beach Shack, a garlic shrimp truck that parks itself at the Hilton Hawaiian Village (just west of our hotel), while the boys visited a ramen noodle stand at the condo high-rise just east of the hotel. Dave and I enjoyed watching the sunset with our box-dinners. Gilligan’s Shrimp Truck. Relatively cheap food, perfect to watch the sunset! …and here’s the sunset we got to see while eating our shrimp dinners! According to my FitBit watch, today was a 25,000 step day. We have a pretty cool adventure planned for tomorrow — stay tuned!